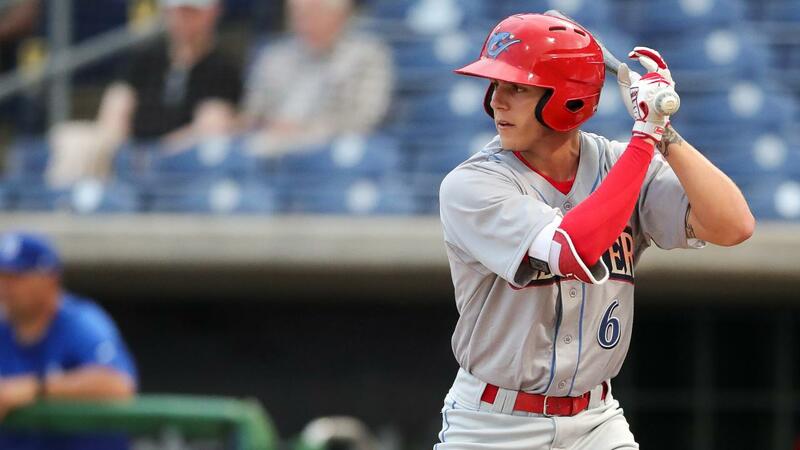 KISSIMMEE, Fla. - Nick Maton broke out for a career night on Monday, driving home five of the Clearwater Threshers' six runs in the series-opening, 6-0 shutout over the Florida Fire Frogs at Osceola County Stadium. The win snaps the Philadelphia Phillies affiliate's four-game losing streak. Jhailyn Ortiz started the scoring for the visitors with an RBI single in the first, and Maton created a four-run cushion with a three-run blast to right in the second. Julian Garcia (1-1) took the lead and ran with it through six scoreless frames in his second start of the season. The right-hander gave up just two hits and walked three, and tallied seven strikeouts in his first win of the year. The Broomfield, Colo. native allowed just one runner to reach scoring position when Isranel Wilson reached third in the third, but the 23-year-old struck out Riley Delgado to get out of the inning unscathed. Both sides exchanged zeroes heading into the ninth, but Maton connected for a two-run triple to push his RBI total to five on the night, setting a career high for the 22-year-old. The Phillies' 18th-ranked prospect (MLB.com) bested his previous high of four set back on Aug. 15, 2018 against the Rome Braves (ATL). Luis Carrasco and Connor Brogdon worked the final three innings out of the bullpen for Clearwater (3-9), with both men combining for three free passes and five punch outs. With 12 more strikeouts on Monday night, the Threshers pitching staff has collected 143 through the first 12 games. Tristan Beck (0-1) suffered the loss for Florida (5-7). The right-hander surrendered four runs on five hits, three walks and six strikeouts across 3.2 innings. Clearwater takes aim at its first series victory in the middle game of the three-game series at Osceola County Stadium on Tuesday night. It has yet to be determined who will start for the Threshers against Fire Frogs RHP Freddy Tarnok (0-1, 4.82). First pitch is scheduled for 6 p.m., with coverage beginning at 5:45 p.m. on threshersbaseball.com.